Contact the Commish @ Torreano@aol.com if you're interested in joining any of the leagues above. The Ultimate Fantasy Football Leagues are some of the most fun, competitive, and enduring online fantasy football leagues around. 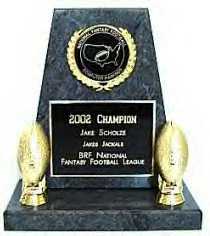 The first UFFL league started in 1995 and has since expanded to nine unique leagues. UFFL leagues consist of Redraft, Keeper, Dynasty, Standard Draft, Auction, IDP, and Survivor type leagues. All of the leagues consist of 12 teams and feature head to head play with the playoffs starting in week 14, high performance scoring (ppr), and live scoring. UFFL leagues are hosted by MyFantasyLeague.com, the best fantasy football management site on the Internet. Whether you're a first time owner or a veteran of the game, UFFL has a league for you. If you're looking to join a dynasty league, check out the Twisted Dynasty Fantasy Football Leagues, established in 2015. The TDFFL consists of six dynasty leagues, all competing in a tiered pyramid system. The goal is to do well in your league and move up the pyramid, qualifying to participate in the following season's Champions Tier League. The TDFFL Leagues are MFL Showcase Leagues. The prize money is 100%, there are no costs to host the sites at MFL.com. Signups for the 2019 UFFL and TDFFL leagues are currently ongoing. Check out the leagues below and best of luck in 2019! Standard Draft Leagues: Standard draft leagues are the most popular and generally begin with teams selecting all their players in a serpentine style draft. Owners then set their lineups each week based on the number of players per position allowed by league rules. Auction Leagues: In Auction Leagues, owners are given a predetermined amount of money to bid on players to fill their roster. Players are nominated and owners may bid on any player he likes but if an owner overspends on one player, the rest of his roster might suffer because he does not have enough remaining cash to fill other positions with quality players. Going once ... Going twice ... Sold! Dynasty Leagues: Dynasty leagues are for the serious fantasy football owner and require a commitment over multiple seasons. After the initial draft in a dynasty league's inaugural season, players remain on the same roster from one season to the next unless they are traded or released. Each year after the initial season, a draft is held for rookies and free agents only, so fantasy owners must be more in tune to the talent in college than an owner in a standard draft league. This type of league also allows owners a more realistic experience managing a franchise as they must take into consideration how each transaction affects the future of their franchise. Redraft Leagues: 18 round fantasy draft every year. If you enjoy drafting an entire team from scratch each year, then choose a Redraft League. Keeper Leagues: Keeper Leagues are the perfect mix between Dynasty and Redraft Leagues. The first year you have an 18 round draft. Each subsequent year you keep up to four players. You�ll be able to keep your best players while still enjoying an Auction or Draft. This format creates a lot of trading. If you want the realism of a Dynasty League while still enjoying a large draft each year, then Keeper Leagues are for you. Survivor Leagues: Survivor Leagues can utilize any type of draft, however, they usually use a standard or auction type. What makes a survivor league unique is that the team scoring the least amount of points in a particular week is eliminated for the remainder of the season. So in essence, on a weekly basis all a fantasy owner needs to do is avoid having the lowest score of all teams in the league. Of course, as the as the weeks go by and the number of teams drop, it becomes increasingly difficult to do just that. The last team remaining after all others have been booted is the survivor and is crowned league champion. IDP Leagues: This type of league utilizes defensive players on an individual basis rather than as a defensive unit, which is common among most other types of leagues. The additional players and positions to fill require owners in an IDP league to do a lot more research to determine which defensive players to draft, and when. Contact the Commish @ Torreano@aol.com if you are interested in joining any of the above 5th year dynasty leagues.